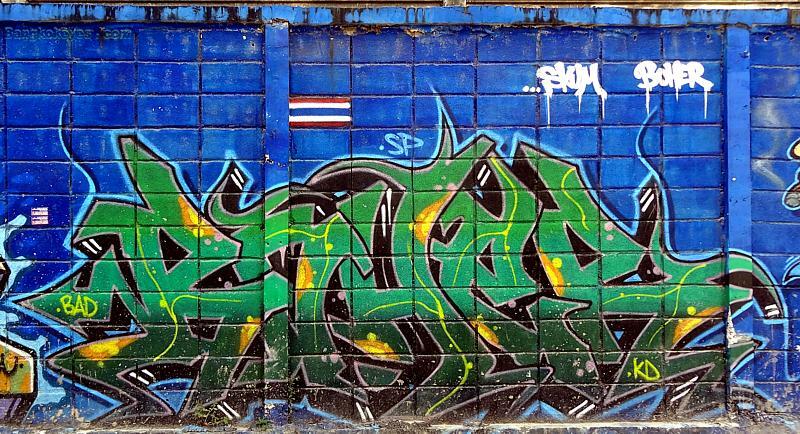 There is still a number of long-time Bangkok resident expats and return visitors who remember when Soi 22 boasted nothing but the Starlight Hotel, an un-air conditioned, 2-star hostel located down a small side soi, and a seemingly unending tract of swamp. Built above the swamp, and cut off from the rest of 'Bangkok civilization' were myriad shacks - all for rent. 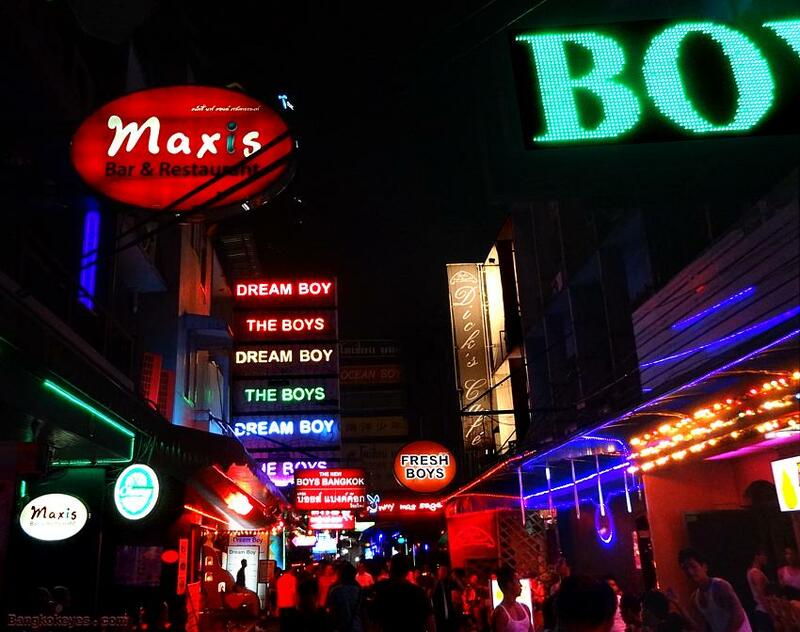 Their occupants were almost exclusively bargirls from the Soi 16 bars, the Grace Hotel Coffee Shop, the Thermae, Soi Cowboy and other Sukhumvit Nitespots stretching all the way up to, and just past Soi 26. The shacks were connected to each other, and to the 'outside world', by a network of wooden planks supported on wooden pole 'pilings', sometimes with a handrail, sometimes not. Barring flooding in the rainy season, the planks which comprised the inches-wide web of 'boardwalks' hovered just above the black viscous stench that was, at one time, probably water. It's overwhelming 'aroma' was that of of raw sewage and Fab detergent from the hundreds of one-bucket-laundries. The shacks themselves were constructed of whatever was available - sheets of tin with printed Fanta or Singha labels still visible on the never-to-be fabricated cans, as well as plywood forms from building sites, reused construction board, scrap crating and dunnage, and if you were lucky, corrugated sheet metal roofs (which became eyes-wide-open amplifiers for each individual raindrop during the torrential Southwest monsoons). Scores upon scores of Ladies-of-the-Evening called this chum chon their 'home-away-from-home' - a mattress on the floor, just wide enough to accomodate an occasional one-night john or a Thai mangda 'boyfriend'. A few small cushion pillows (including one long-pillow) sufficed. No mattress, regardless of condition, was complete without a floor to ceiling mosquito net - and mosquito coils to burn, just in case. The desk fan (on the floor) was mandatory, and the refrigerator (unheard of) was supplanted with an ice bucket or a small styrofoam cool chest. Also mandatory were the thoop (joss sticks) - paying respect to luck-bearing Buddha, but also to ameliorate the pervasive reek of the underlying Black Lagoon. 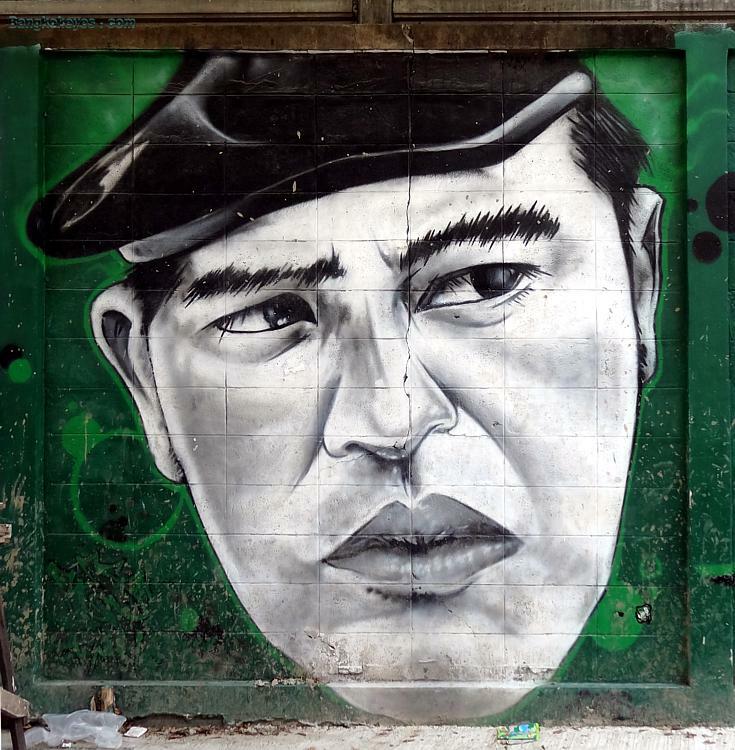 To hide the bareness, and to discourage peeping Toms, calendars and large posters of the King Rama IX (alternate; King Rama V), or movie stars, flower-filled fields, babies and/ or far-away places were taped, tacked or glued to the walls. A time and place -some would say an era- almost forgotten for many expats, a rite-of-passage for others. But, that was then, and very long ago - and with nostalgia not being what it used to be, it is time to move on. 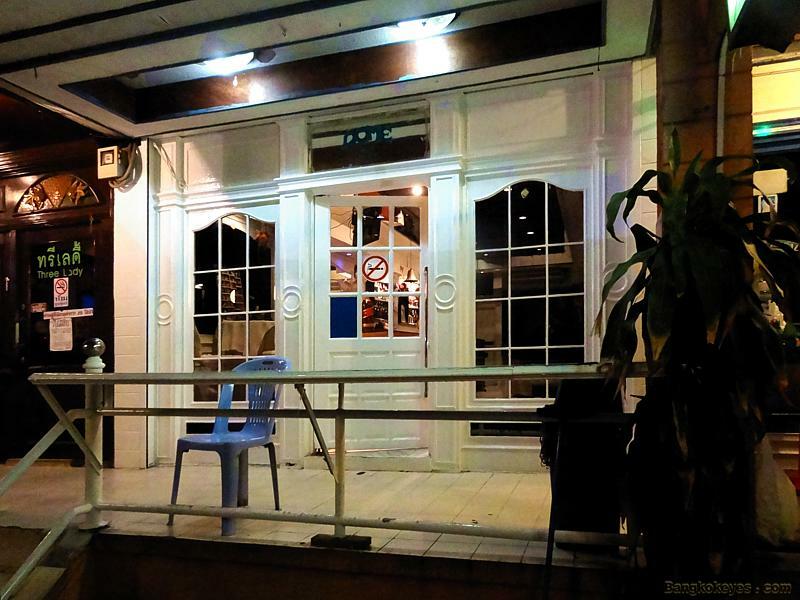 Our first foray into Soi 22, at least as far as Midnight Hour is concerned, was back in June of 2002, when we introduced the Queen's Park Plaza Night Entertainment Area.< LINK> which had just reached "critical mass". At that time, we didn't have the slightest inkling that the Soi itself would one day reach it's own "critical mass". We did a follow-up Soi 22-run in November of 2003 - our lead story being the opening of Easy Square deep in the Soi < LINK>. 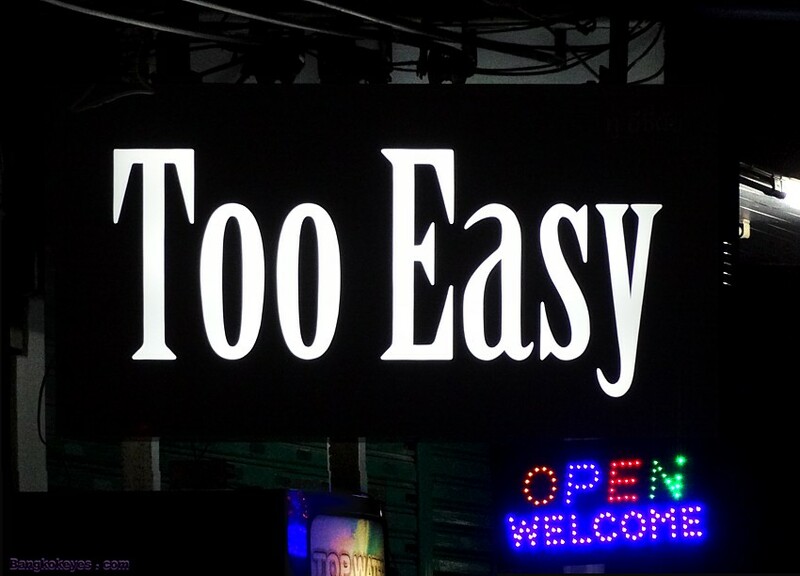 Easy Square became a full fledged Night Entertainment Area the following year, only to close down months after reaching "critical mass". And even then, we at the Midnight Hour had no idea that Soi 22 - the Soi that then hosted Easy Square and Queen's Park Plaza and accessed Washington Square would become an independent 'stand-alone'. 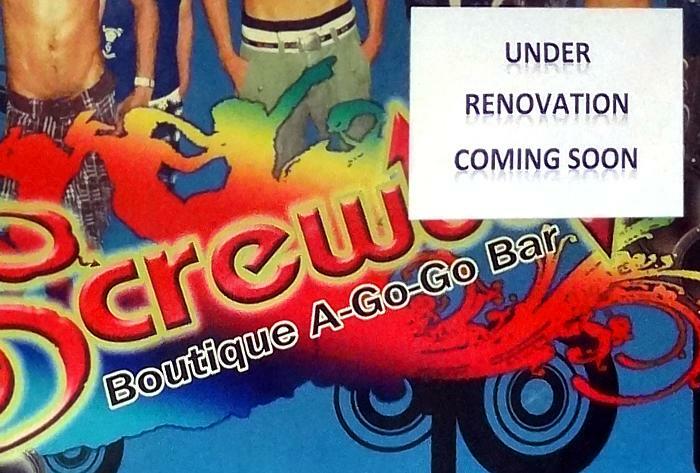 Around about 2005 - 2006, we saw some changes - a number of new Nitespots. 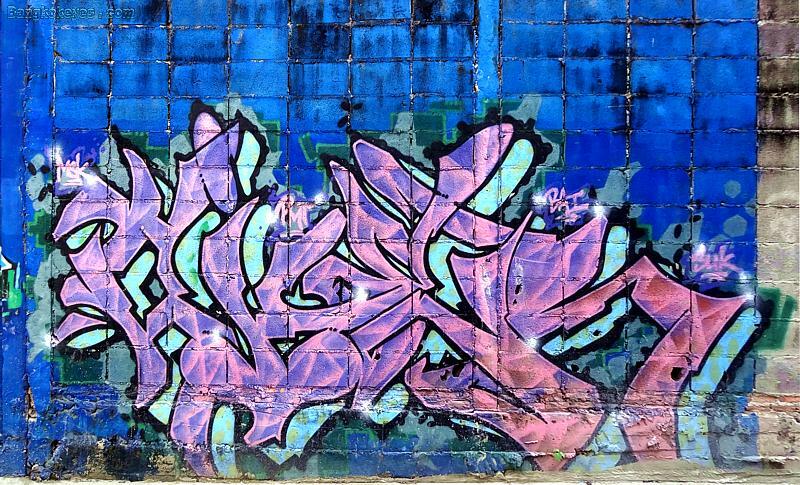 We got curious - time for another look - was Soi 22 becoming a Nitespot Hub of it's own? We did an immediate resurvey (in November 2006) < LINK>. 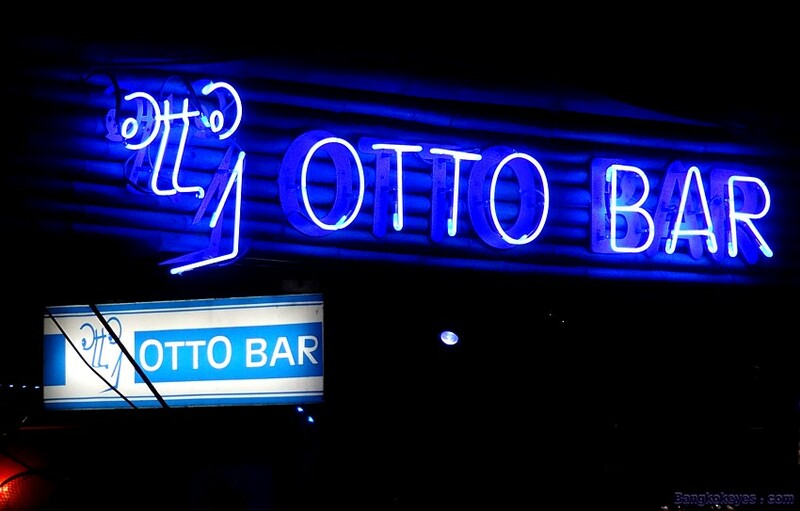 However, after an interesting reappraisal, it was obvious that the Soi wasn't yet a "Night Entertainment Area" by the strict definition. And we had our doubts it ever would be. Likewise, in December of 2010 < LINK>, we resurveyed yet again, suspecting that Soi 22 was coming close to the 'magic' combination of sufficient number of venues ("critical mass"), and generally "contiguous", or to say, the Nitespots were within reasonable distance of one another, and able to feed synergistically off of their mutual customer attraction. Again, we found gains, but still 'no cigar'. 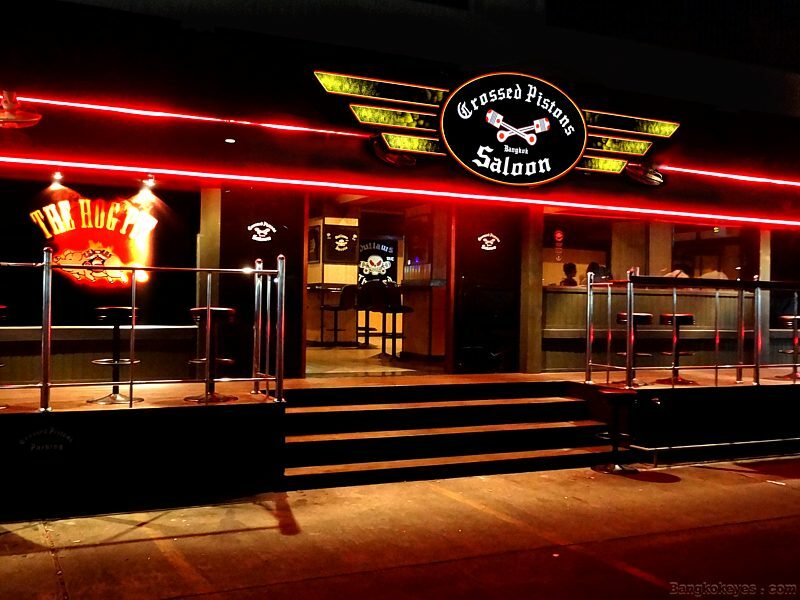 However, over the last 18 months, or so, there has been a rash of new Nitespots, many of them massage parlors, but also a number of new bars and larger pub style venues. This time around, there could be no denying that the Soi had adequate 'population density' - and with the long standing Imperial Queen's Park Hotel a solid standard and a source of custom (along with some of the smaller hotels further down also providing additional customer base), the increase in numbers of venues and the increase in Night Entertainment business obviously was not a fluke. And now that the new Holiday Inn Hotel is about to open at the top of the Soi, from all appearances, it's going to be more than a little busy in Soi 22 in the evenings. The future, as they say, looks bright ahead - so much so, that we suspect land / lease prices will be rising substantially as they have done in recent years in Soi 33, Soi Thonglor, etc. In our survey of Soi 22 this month we looked into the extent of migration from the recently defunct Washington Square into Soi 22. 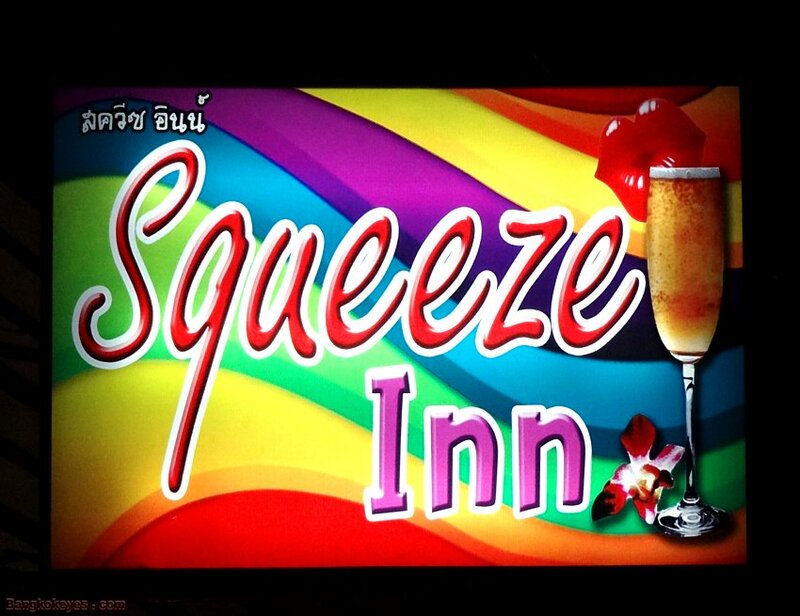 We did note that the B 52 moved into Queen's Park Plaza, and the people who run the Easy Pub (still open) have opened up the Squeeze Inn (and perhaps the Too Easy) on Sub-soi Titanium. For purposes of this write-up, and for subsequent monthly updates, we will be incorporated the last four remaining bars previously on the Washington Square inventory. ..........Nevertheless, all said and done, we're betting that there are more than a few of you out there who would trade almost anything for just one or two more "lost nights" - your ti rak clasping tightly to your arm, helping you to negotiate those creaking planks through the rain, lighting up those mosquito coils and a troika of joss-sticks, then, under the drum-roll of rain on the roof, switching on that noisy rusted-out old fan. And, late into the night, sweating heavily under that mosquito net - on a thin, lumpy, unfamiliar mattress - mere inches above that coal-tar black goo in the swamp below. I have noticed you mentioning New Petchburi Rd in a couple of your issues / articles. 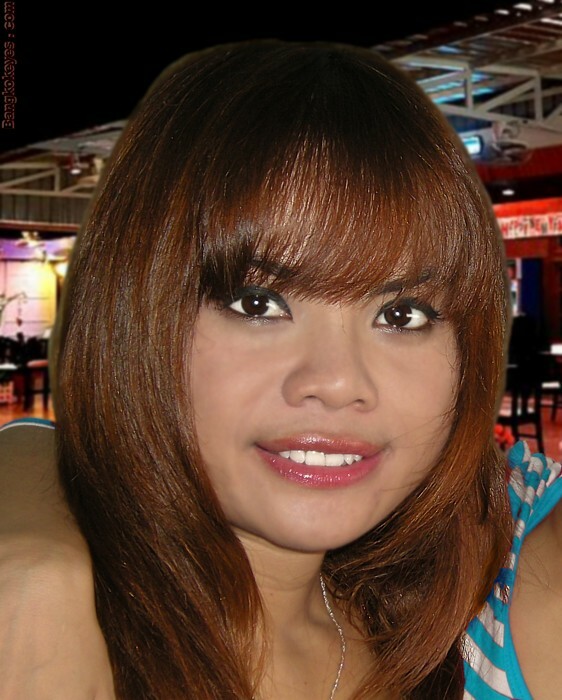 Long ago, while I was in Uncle Sam's employ, I R&Red here a couple of times. I always remember the Rhapsody as the favorite place, but you don't mention it. Do you by chance know if it's still there, and where it is, or was located? Wasn't it located near Jack's American? Your email takes me back. The Rhapsody is long gone. I remembered the name Rhapsody, but was not a regular there, so I asked a friend, and he remembers the Rhapsody, and the California (another one I remember from that era) were both more or less across the street from the Thai Heaven, not too far from the Morakot Hotel. Jack's American Star Bar was further down Petchburi Road nearer Soi Ekamai. 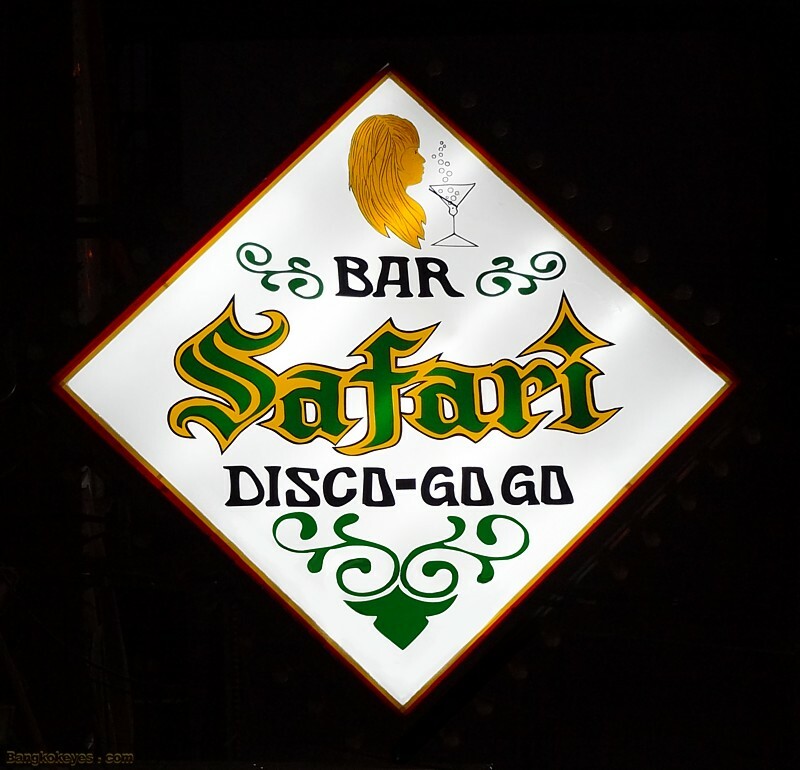 The oldest A Go-Go bar (but not the oldest bar) on Patpong is the Safari - which is starting (very slowly) to make a bit of a come-back. Let 'er rock, then. Below is a pic of their now classic neon - one for the archives. We have to hand it to the Black Pagoda - for the graphic arts and for self-promotion, there are none out there that can beat them. (And perhaps some of the others should take a page....) May they persevere. Never having put up any neon, they didn't have any to take down. It appears that the tentatively named Peuan (Friend) bar never really got ahead of the power curve. Next time around, if there is a next time, let's hope they grab the brass ring. The diminutive (by Cowboy's current 'Las Vegas' standards) Five Star just keeps on pumping - and doesn't seem to mind being surrounded by the big dogs. 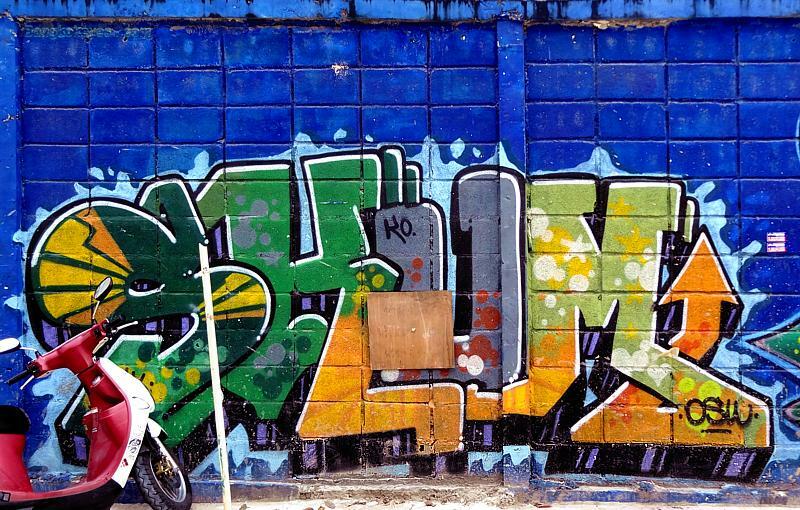 Their subtle door art can, however, catch the eye - a colorful shot of one of the 'Boy's older single-shophouse bars. - And a well-earned 'Door Art Of The Month'. 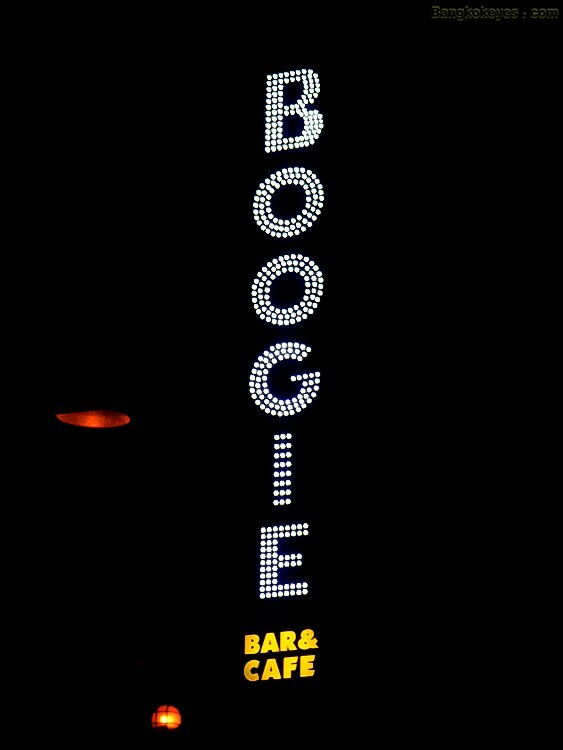 This month, the Lollipop A Go-Go has made up it's mind on their neon - they have electrified their last month's sign - all to great effect. Wish them constancy. 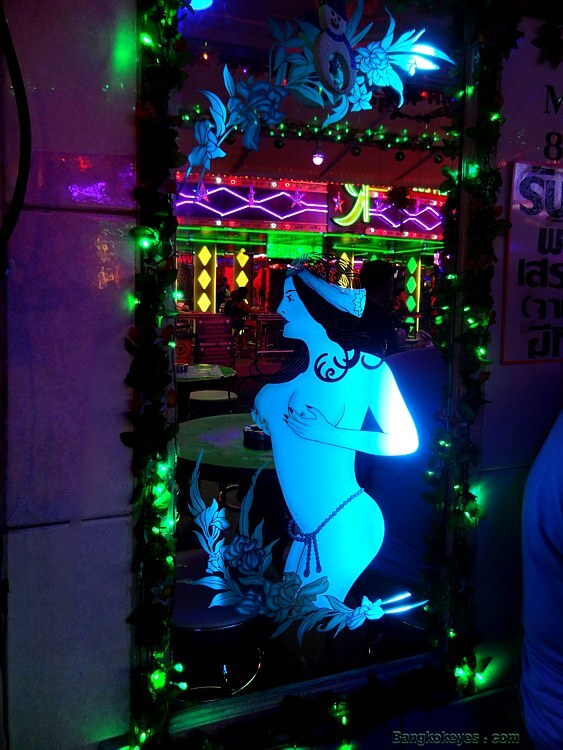 A for-the-archives pic of the Bangcockney's neon, one of Soi 4's older bars, located at the cut-out to Soi 6. Keep doing whatever it is you are doing, gents. Commencing with this issue Washington Square will no longer be carried as a separate Night Entertainment Area. 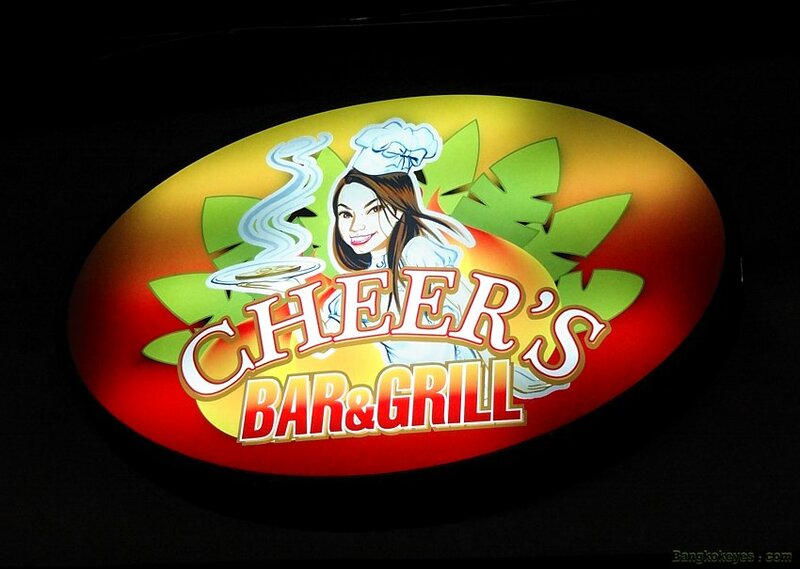 The four remaining bars, Denny's Corner, Easy Pub, New Square One and Sidewalk Cafe will be considered as part of Soi 22 Night Entertainment Area (see immediately above). 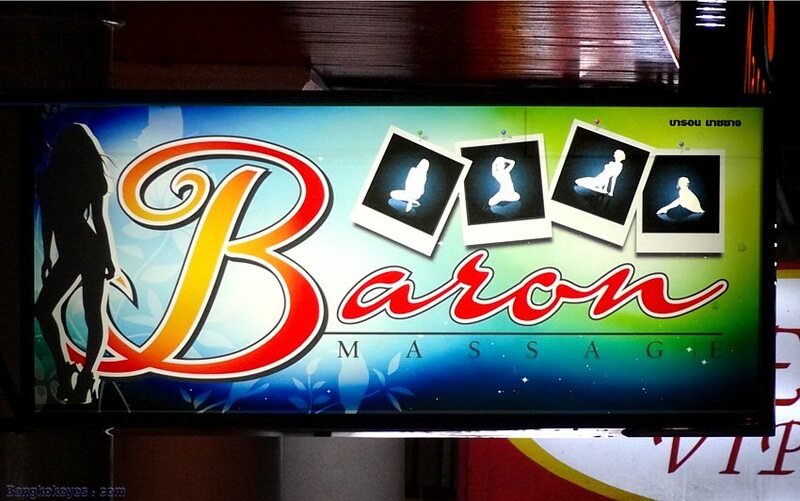 The Baron Massage has just opened it's doors to the public - and it appears they offer the gamut of services. They have taken over the old original Teen Massage (and yes, the Teen 3 VIP Massage is still in operation three doors down - it hasn't gone anywhere). Welcome them to the neon circus. The Magic Massage has just opened for business a few quick steps down Soi Wall Street in the old Hookers digs. May the fates deal them all aces and faces. The Red Wine Snack has just opened up inside Soi Pan Pan. Our expert in all things Japanese, the Ajarn T, advises that a "snack" is a small, usually dimly lit, comfortable 'lounge' style Nitespot, oftentimes run by a woman. 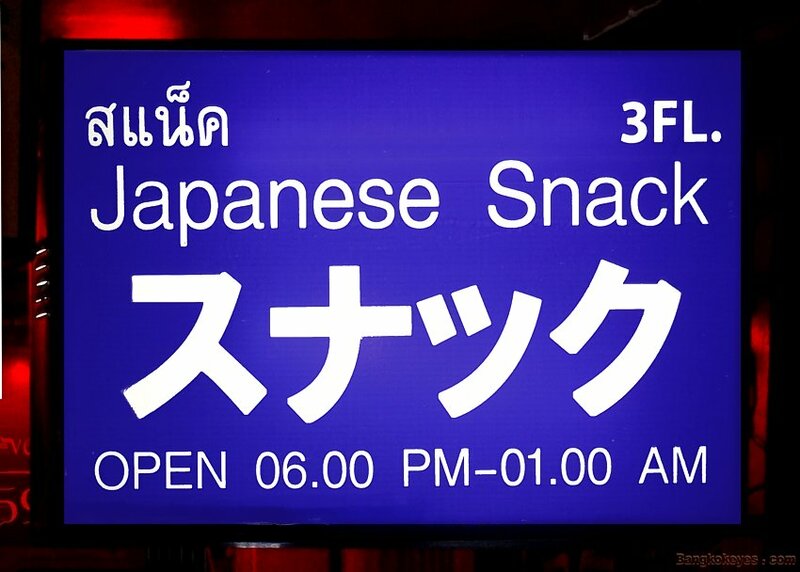 And to be slightly obvious, 'snacks' are geared to Japanese clientele. 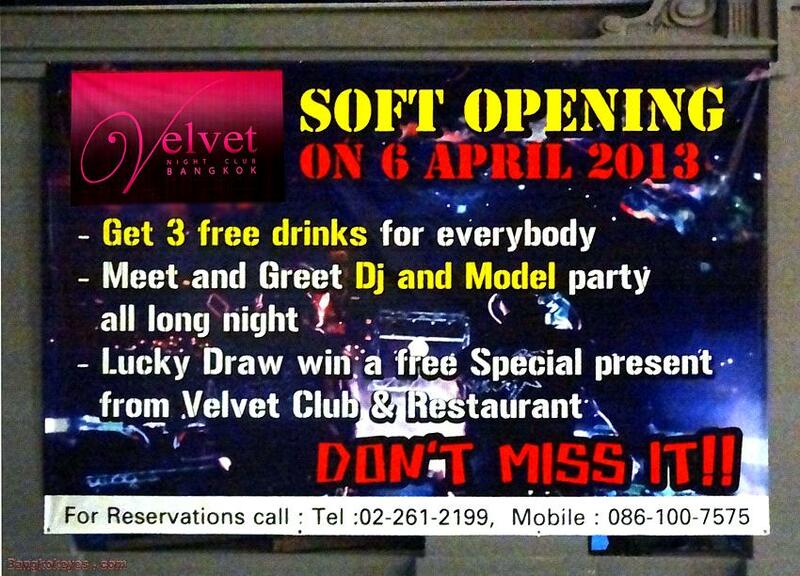 If the soon-to-be opening Velvet Club's sign is to be believed, this style of nightclub - which offers D.J.-style entertainment and 'models' is usually the domain of the wealthier Thai night crawler. -As found in the larger 'multiplex" entertainment emporia in the RCA or Rachada Entertainment Areas.  This promises to be something new for the Soi Dead Artist crowd. It will be interesting to observe how things proceed - with 3 free drinks, they may need a phalanx of bouncers just to keep the crowds out... Note: They will be opening in the old Christie's digs. 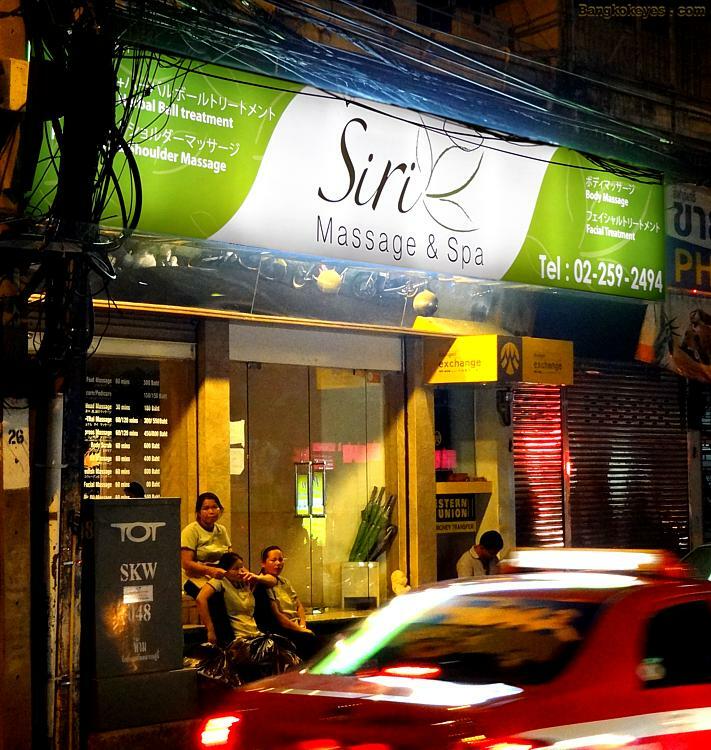 A for-the-archives shot of Lek Massage - they have stood the test of time, and have even opened a branch (Lek 22 Massage) deeper in Soi 22. Keep on keeping on. 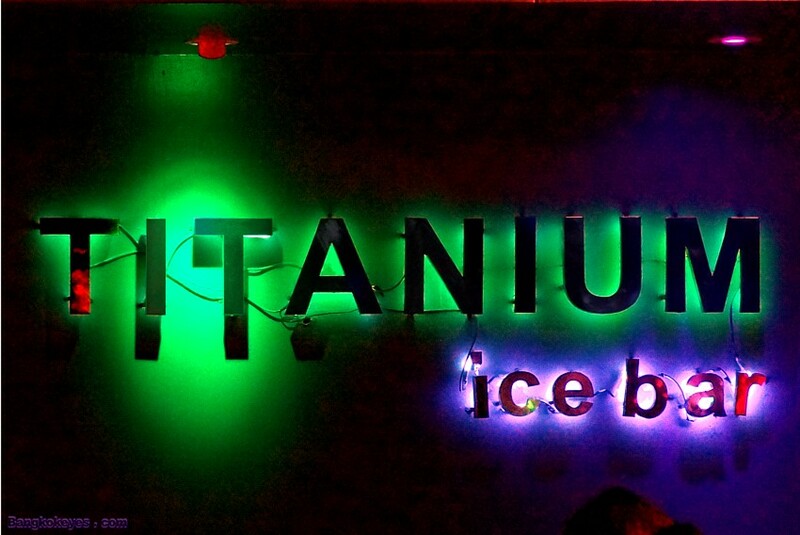 The Sip Song have finally (we think) fleshed out their neon signage - this last bit a definite eye-catcher. 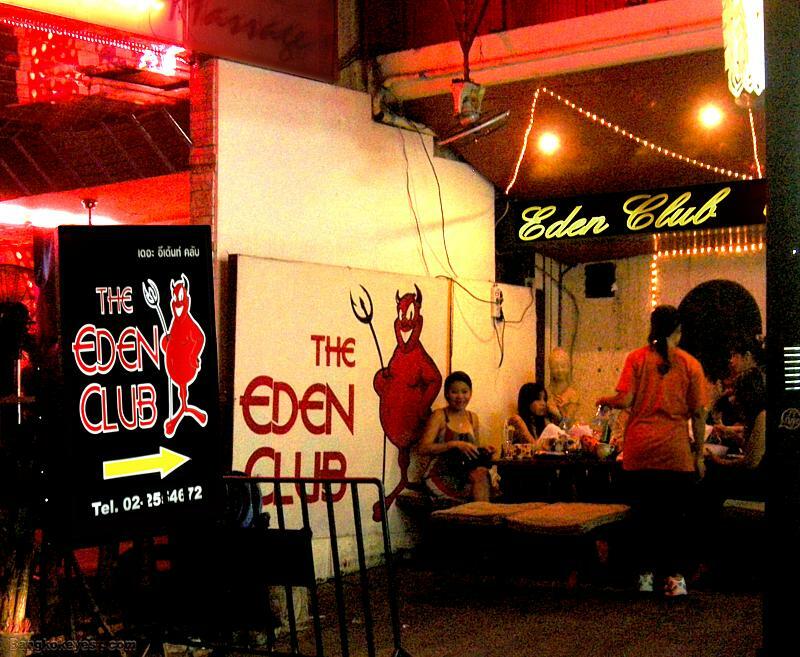 The Eden Club specialty massage has closed it's doors... without the usual posted sign saying that they have gone on a holiday, or that they have closed early. 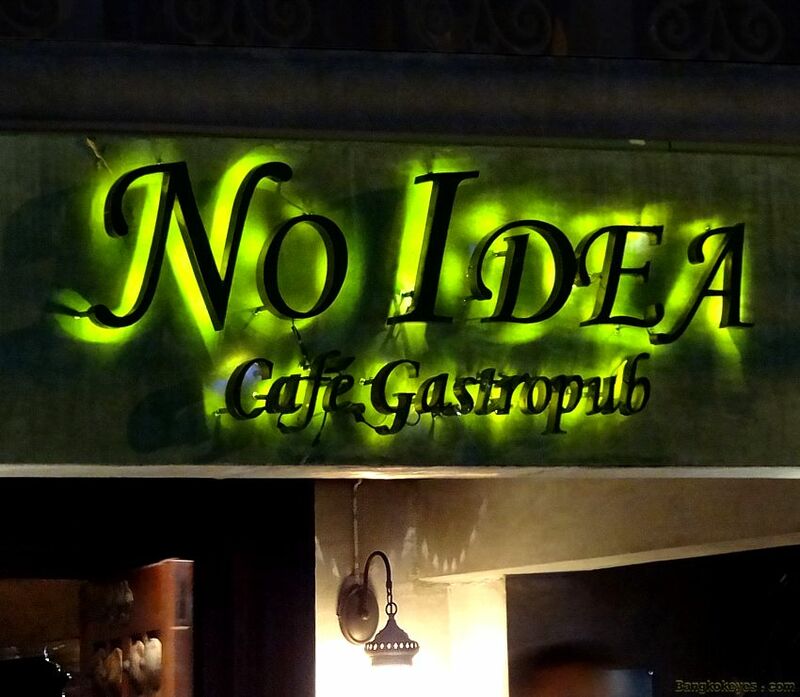 Nevertheless, we suspect they will reopen soon. We'll keep an ear to the ground, and get back atcha. A shot of the 'Twilight Zone' from the Surawong Road side looking in. No changes that month / year. * Up on the Foodland Carpark the Abumi closed it's doors. No Nitespot now exists at that location. * The Tony's Bar reopened after a brief closure. The Sahara now holds down that property. * Shebas opened it's doors for the first time. It opened in the renovated Nice Bar digs. Shebas has closed and is now being renovated. * Up on the second floor Spankys rolled out it's red carpet for the first time - it is still there today. It opened in the then-recently closed seminal Three Roses digs. No relation to the Spankys in the Cowboy Annex. * The Kool Spot Pub closed - but it would be for a very brief one-month period. * The Banana Bar reopened after a one-month shut-down. This is currently home to the Classic Club. * The Say Hi bar did a quick relocation, while remaining open. * The Today and the Airport Bar combined into a single venue. * The O 2 bar opened up new along the side fence on the "Plaza" side. 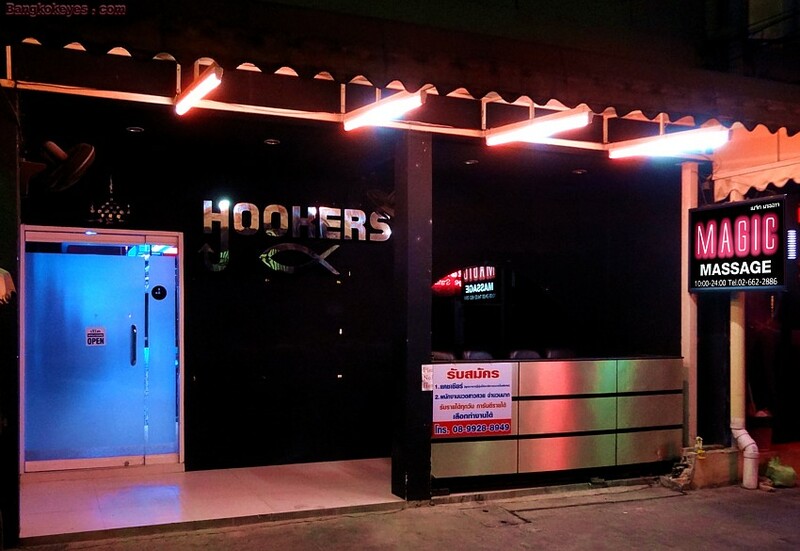 * Rin's Karaoke, located on the left in the "Asoke Corner", closed it's doors. 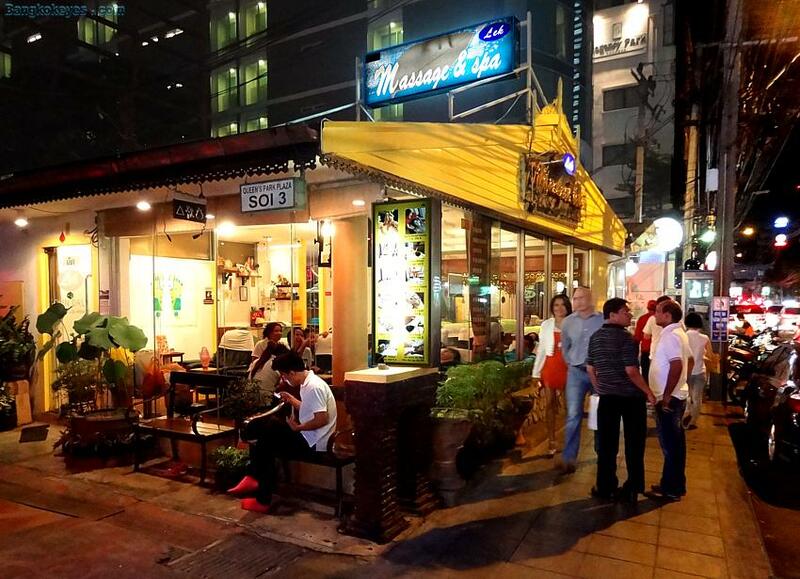 * The Prime Bar closed - located on the right in the Asoke Corner side. * The Lucky Bar closed - located in the 8-Pak. * The Witch Bar closed - located in the 8-Pak. 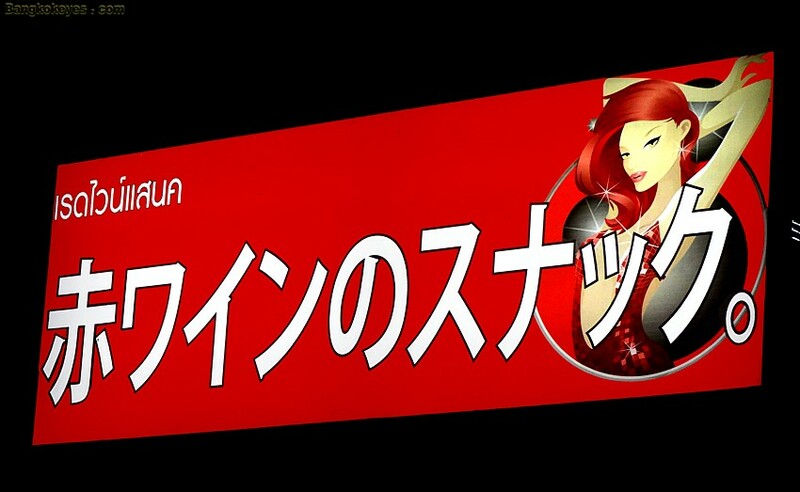 * Only You Bar - was "Princess".